Holo Glitter & Flakie Extraordinaire! Last night I had only one piece of this manicure in mind...the flakies. I collected all five of the Finger Paints Effects polishes, and hadn't used them yet. I could've put them over black, but who hasn't seen that? (If you haven't, you need to look at blogs more.) So, inspired by my good friend Jen who I got to see today, I chose purple. Originally, all I wanted to add to the purple (Grape Pop, China Glaze) was one of the flakies, Twisted. As I was pulling Twisted out of the drawer, I grabbed Asylum instead, and thought that too belonged on the purple. One thing led to another, and after an hour of polishing, I created this agglomeration of glitter, holographics and sweeping joy. Heh...overboard? I just couldn't stop myself! So the final tally for polish usage came out to be five (not including my base and top coats). 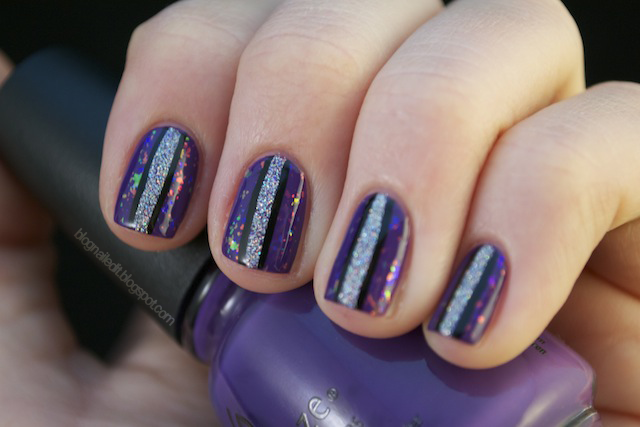 The holographic stripe is Hologram Glitter by Color Madric, and the black is Bad Chick from Sinful Colors. Both are striping polishes with the itty bitty skinny brushes. I can't get enough of those and dotting tools lately. My poor stamps are feeling a little neglected I'm sure. Don't worry guys, I'll get back to you. C'est incredible!!! I'd love to see a tutorial for this. Great combo.. Looks great, I don't think you overdid it! I love your manicure, it's really cute and the color combo is lovely ! I absolutely love this! So awesome!